Plastic, Perforated Paper, and Waste Canvas are novelty materials that can breathe new life into your needlepoint projects. They are amazing shortcut alternatives to traditional needlepoint canvas for stitching designs and patterns. Here are some of the benefits of using them. Time Savers - You can complete a needlepoint project in half the time it takes to work the same project on basic single-thread and double-thread canvas. Stress-Free Finishing – With all three of these novelty canvas types, as soon as you place the last stitch, your project is completely finished. No blocking or stretching is required. Amazing Creative Results – If you are looking for creative ways to stitch needlepoint designs that will make your work stand out from the crowd, these novelty canvas choices should definitely be considered. Given these benefits, it’s easy to see why it would be worth the effort to learn more about plastic, perforated paper, and waste canvas so that you can transform ordinary needlepoint projects from blah to fantastic! Read on for the details. Molded, Not Woven – Plastic Canvas is molded into a shape and form that resembles even-weave fabric canvas. It even has gauges that are similar to canvas mesh. For example, #14 Plastic Canvas has 14 rigid mesh (threads and holes-per-inch)—just like #14 Mono Canvas. The most common mesh sizes of Plastic Canvas are #5, #7, #10 and #14; but #7 is the one most needlepointers prefer to use for quick projects. No Canvas Distortion – No matter how tight the stitching tension, it is impossible to pull Plastic Canvas “threads” out of shape. Cut to Fit the Needlepoint Design - Plastic Canvas can easily be cut with a pair of household scissors into the desired shape of the needlepoint design or motif BEFORE stitching, without fear of canvas threads unraveling. No Sizing – Plastic Canvas does not need sizing; it is naturally stiff. However, there are two kinds of material used to make it--firm and soft plastic. Firm plastic canvas is used for needlepoint items that will need to hold a specific shape. Beverage coasters, luggage tags, tote bags, tissues boxes and refrigerator magnets are just a few of the items that require firm plastic canvas. Needlepoint designs with shapes that need to bend or wrap around other items are better suited for soft plastic canvas. Leftovers, No Matter the Size Can Be Re-Used – There’s very little waste when using Plastic Canvas. Even the smallest piece can be stitched and joined with larger pieces to make needlepoint stand-up figures and other three-dimensional items. The most important thing to remember to do when working with Plastic Canvas is to make sure to cut it correctly. This means cutting as close to a plastic thread and as smoothly as possible with no tiny bumps remaining. Run your finger over each plastic thread after you have cut them to make sure there are no rough areas that could snag the yarn when stitching. Any stitch used to work a needlepoint design is appropriate for Plastic Canvas. Just remember to count the threads instead of the holes. This should be easy for needlepointers, for we are used to counting the intersection of canvas mesh threads when working from a needlepoint chart. Like Plastic, Perforated Paper imitates single thread needlepoint canvas in its grid-like structure. Made of cardboard in an assortment of colors, it has evenly-spaced holes that allow for working most needlepoint stitches. Half-Cross Tent Stitches work exceptionally well with this canvas because of the perforated paper's sturdy construction, which supports the stitches without the canvas showing through. Continental and Basketweave stitches are too bulky for the paper canvas. You do not have to mount perforated paper in a frame or on stretcher bars to stitch it; nor does the canvas have to be taped or sewn to keep it from unraveling. When you are finished stitching, you can cut the paper in any shape you like for final finishing. Most needlepointers use Perforated Paper Canvas when making inserts for greeting cards, gift tags, as well as for holiday ornaments and decorations. Not every needlepoint stitch technique will work with paper canvas. You have to be careful with stitches that share holes, as the continuous working in a hole could tear the paper. Stranded threads are best for working on Perforated Paper Canvas. Thread selections should be tried out on a scrap piece of perforated paper before working them in the needlepoint project. This way you can adjust the thread strands as needed. 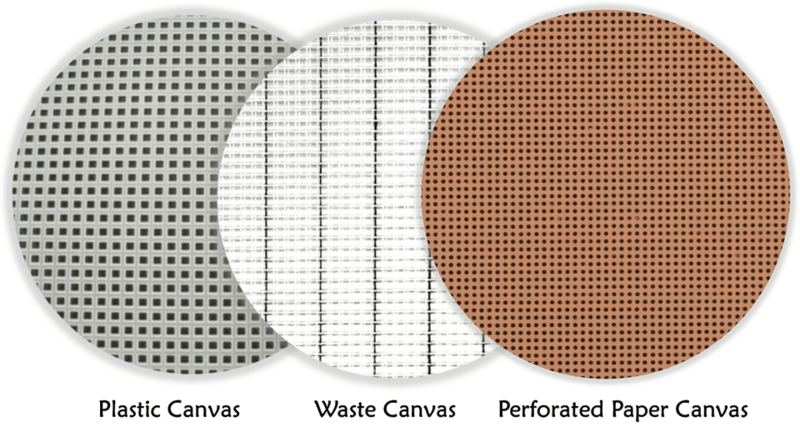 About the only disadvantage to using Perforated Paper Canvas is that it comes in only one size--#14 mesh. Waste Canvas is definitely an even-weave material that looks just like Penelope Double Thread Needlepoint Canvas. To assist you in counting, every 10th vertical canvas strand is woven with a blue thread. What makes Waste Canvas such an exciting material is that it allows you to work needlepoint designs directly on to tightly woven fabrics like denim, organza, cotton or velvet, instead of stitching them on traditional needlepoint canvas and then sewing the completed needlework onto those fabrics. Waste Canvas is made in #6 to #16-mesh and has an incredible characteristic. Once all stitching has been completed, you simply wet the canvas to gently remove its threads! Place a piece of Waste Canvas on top of the fabric to be stitched. Make sure the canvas is large enough to cover the design area and that it is even with the grain of the fabric. Hand-baste the outer edges of the canvas to the fabric to keep it in place. Place on a frame or in an embroidery hoop until taut. (This may require several attempts, but careful attention at this step will guarantee the desired result). Following the charted needlepoint design, make the stitches the same way you would as if working on Penelope Needlepoint Canvas. Work slowly at this step, stitching over the canvas threads and making sure not to split or pierce them as this could hinder your ability to remove them after stitching is complete. Check for missed stitches and make sure that the yarn and fibers are anchored on the wrong side. Use a wet sponge to gently dab the Waste Canvas. Carefully remove each canvas strand one at a time beginning with the horizontal strands, and then ending with the vertical strands. Let the fabric dry thoroughly while still in the frame or hoop. Some needlepoint experts believe that Waste Canvas should not be used for working needlepoint designs. They feel that it does not adequately support needlepoint stitches, and should be used exclusively for other types of embroidery. I happen to disagree with this view—quite vehemently, actually. Needlepoint can be worked on any ground material that has an even weave. Waste Canvas works just fine with a little patience and the proper needlepoint supplies. Here’s how to successfully use it. Stitch with colorfast cotton thread, as waste canvas has to be moistened to remove it from the item you are working. Make sure that the fabric you have chosen to work your design is colorfast and can get wet as well. Although needlepoint is worked with a blunt-tipped​ tapestry needle, you will need to use an embroidery needle with a point sharp enough to pierce through the fabric under the waste canvas in order to make the stitches. Use a frame, stretcher bars or even an embroidery hoop to keep the fabric and Waste Canvas taut as you stitch.